Cutting composites is uniquely difficult when compared to cutting wood, metal, or other more traditional building materials. There are a several reasons for this, but there are three primary factors which impact tool selection when cutting laminates. First, reinforcement fibers are abrasive. Since carbon fiber, fiberglass, and Kevlar® fibers can be abrasive, tools with traditional cutting edges dull quickly, effectively shortening tool life. In addition to wearing out your tools quickly, cutting composites with dull tools increases the likelihood that you will damage the material while also increasing the severity of overheating, our second factor of consideration. Composites do not typically transfer heat very well. Resin and cut fibers carry away relatively little heat, unlike metal chips, and overheating can melt resin or prematurely dull your tool. When resin melts, it can also clog your cutting tool or damage the finish of your part. In severe instances, there can be enough heat build-up near the edges of a laminate to sacrifice the structural integrity of a part. 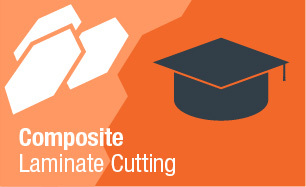 Lastly, composites can delaminate when cut. Delamination varies from minor edge chipping (burrs, and fibers showing on poorly drilled holes/poorly trimmed edges) to major stress fractures due to poor bonding of resin to reinforcement. Each of these factors will affect your tool selection, and determine how you will cut your composite. While there are a variety of methods available (including 5-Axis CNC machines, water jet, and laser jet), the majority of fabricators will cut with either basic rotary tools or straight blades. Before we get started, it should be noted that while carbon fiber and fiberglass dust is not toxic, it is a mild irritant to the skin, eyes, and lungs. We strongly recommend that you wear a dust mask and eye protection to minimize any itching or irritation, especially when cutting or sanding in quantity. Edges can be very sharp, so gloves are also critical to avoid cuts and slivers. Check out our safety supplies to find all of the products needed to ensure you are cutting composite laminates safely and correctly. Rotary tools are the most widely used method for cutting composite laminates. Whether you are cutting carbon fiber sheet or a fiberglass hull, there is usually a rotary tool just right for the job. Rotary cutting tools vary from small handheld rotary tools, like a Dremel or pneumatic rotary, to routers and even angle grinders. Rotary tools are used for cutting and finishing all types of materials. They are portable, versatile, and easy to use and they make quick, smooth cuts. When cutting tubes or rods with a rotary tool, we recommend making cuts from the top down. 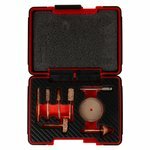 You will likely need dedicated accessories for cutting composites, even if you own a rotary tool. Since most common bits and blades aren't made specifically for cutting composites, they will likely be prone to wear prematurely and introduce fraying or chipping along laminate edges. They can also get clogged with resin. Abrasive or grit-style cutoff wheels or drums, made from diamond or tungsten carbide, for example, allow your tool to retain its edge. Diamond is the hardest natural material and is often used for cutting tools for this reason. 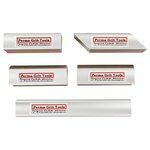 The Perma-Grit cutting tools, also available on our website, feature a tungsten carbide-grit cutting surface, and are designed for use with composites. Tungsten carbide is one of the hardest known materials next to diamond, and the grit found on Perma-Grit products is more aggressive than typical diamond tools, allowing you to cut, shape, and sand composite parts quicker, and likewise, with less heat generation. Rotary tools allow you to cut to, or close to, your finished edge. They are easy to use, relatively inexpensive, allow for small and accurate cuts, and when using appropriate blades or tools, require little or no finish sanding. They do, however, generate dust and more heat in general (due to high RPMs). Because they're handheld, they also make it difficult to make square cuts, and may skip along the surface, potentially causing damage. Rotary Attachments These tungsten carbide rotary attachments are designed to cut with great precision, able to easily cut through fiberglass and carbon fiber laminates. 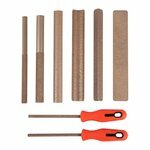 These tools will allow for quicker cutting, shaping and sanding, when compared to a diamond tool. Fabricators also cut composites with straight blades. Straight blades employ a back-and-forth method and range from handheld coping saws and hacksaws to saber saws and jigsaws. The back-and-forth motion of straight blades typically introduces more edge damage than rotary tools. This is minimized, however, by using hand tools since there isn't as much cutting force. Blade selection is critical with regard to using this method. Most blades are made with a 'tooth-style' cutting edge. Tooth-styles wear quickly when subjected to the abrasive fibers and heat generated when cutting most laminates. They also causes extreme edge damage, particularly when using coarse-tooth (wood) blades. Fine-tooth (metal) blades introduce less edge damage than coarse, but they also wear quickly and can get clogged with resin. Tungsten carbide grit-style blades introduce the least amount of edge damage, last longer, and cut more quickly. Jigsaws and saber saws use a very quick back-and-forth motion that allow for straight or curved lines in laminates. They are best used on flat surfaces or small diameter tubes and rod due to their short stroke. Fibre Glast offers two Perma-Grit tungsten carbide jigsaw blades. With straight blades, low-cost hand tools can be used to make extremely small cuts. Electric-powered jigsaws or saber saws add the benefit of cutting significantly faster than rotary tools. Fabricators should note, however, that the back-and-forth motion of straight blades causes more edge damage than rotary tools. Because of this potential damage, we recommend cutting shy of your intended finish cut line and using a sanding block or file to draw back the edge. 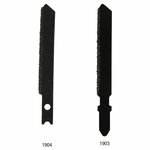 Jigsaw Blades Jigsaw blades are perfect for making large cuts or for cutting along flat sheets of laminate composites, such as fiberglass and carbon fiber. They are designed to cut in both directions and file the edges of your laminate as you cut, reducing chances of chipping to the surface. A top-quality edge will require one final step. After a part has been cut, we recommend using our Perma-Grit sanding blocks or hand tools to straighten out and clean up your edges. Unlike traditional sanding equipment or files, Perma-Grit products will not wear quickly, don't get clogged with resin, and permit faster sanding. Fibre Glast offers a variety of different sanding blocks and hand tools to help with everything from long straight edges to complex cuts, holes or corners. Once your cut edge has been properly sanded or filed, you can protect the edges of your part by simply mixing a small batch of resin and carefully applying it to the cut edge. You can apply with either a small brush or by wiping the resin on with a lint-free cloth. Coarse Hand Tools Hand tools can be used to cut slots, finish edges and shape composite materials. These coarse tools are extremely robust and allow for aggressive cutting and shaping. Fine Hand Tools After working with coarse grit hand tools, it is recommended you move towards a finer grit hand tool before finishing out your surface with a rubbing compound or wax. This will give you the ideal, smooth finish from which to work. Sanding Block The back and forth motion of a jigsaw blade can increase the risk of edge damage on your composite laminate. To avoid this damage, we recommended that you cut just shy of your intended finish cut line, and use a sanding block in order to file the remaining edge.